We drove into New York with great excitement. We expected the "first Iranian-American street festival" to be filled with people, vendors and various cultural activities. What we saw was just a lot of people wondering around and -- for lack of anything better to do -- checking each other out. 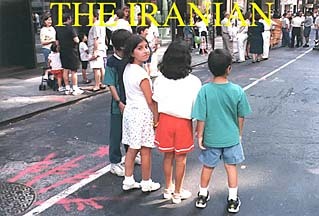 Although a disappointment in terms of organization, the New York festival showed Iranians in a much more relaxed and confident state about their Iranianness. You could see individuals representing all religions and political affiliations (even a woman in full black chador). But there was no sense of fear or suspicion, which were common among expatriates after the revolution. You could feel an invisible bond, even toward strangers. The same feeling was there during an Iranian festival in Washington, DC, a month later. The big difference was that this time the organizers got it right. The thousands of people who showed up were offered a lot more; from books, to carpets, art, financial services and of course all kinds of food. The music, again, was the center of gravity. The DC fair was held between the White House and Capitol Hill. Yet other than a minimal police presence, there were no obvious security arrangements. Even Americans walking through the fair were surprised to see such a large display of Iranian culture in the heart of their capital. Times certainly have changed.